Home » Germany » Das ist Oktoberfest! Trinken Sie Bier? It’s time for Oktoberfest in Germany! 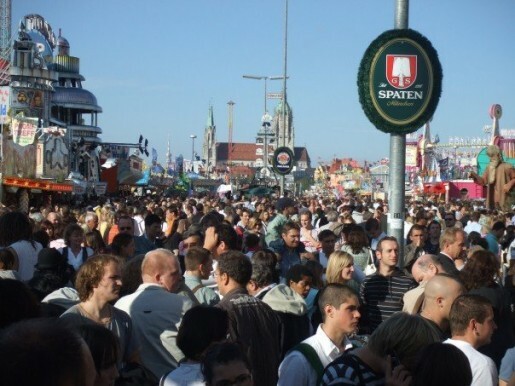 Anyone can visit Oktoberfest, which takes place in Munich, Germany. It opened on September 19, and will go through until October 4, 2009. It is recommended that you visit as early as possible. Even though entry is free, it is likely to be swarmed. 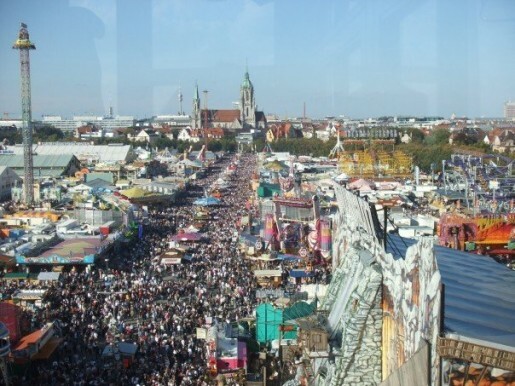 Oktoberfest is the world’s biggest fair, as six million people from all over the world attend annually. It is a vital part of Bavarian culture. If you walk around Munich during Oktoberfest, you will notice a great deal of shops selling Leiderhosen and Bavarian Barmaid costumes. It is a regional celebration instead of a national one; you will hardly find anyone there from Berlin, from historical dislike of Bavaria. The first Oktoberfest was in Munich on October 18, 1810, celebrating the marriage of Crown Prince Ludwig and Princess Therese of Saxe-Hildburghausen. The celebrated by holding a horse race. It took a break from 1812 through the Napoleonic War, and then started again in 1819. The citizens of Munich organized the festival and decided it was to be celebrated every year without exception. It was changed to taking place in September, as that has better weather. It was canceled a few times throughout the nineteenth century due to wars or disease. In 1881, the important move of selling bratwursts at Oktoberfest booths was implemented. Beer served in steins, probably the most important thing, began in 1892. It was then canceled again throughout WWI and WWII. It started again as a full celebration in 1950, and emerged into an international party in 1960, which was the same year they ended horse races. It is a crowded, very interesting festival. The main attraction is the beer tents, which are huge and potentially sit thousands of people. You can buy big steins of beer, delivered by ladies in bar maid outfits, and rock out to live bands that often play American hits. Outside of the tents, there are many other activities, like rides, games and shopping. You can ride a Ferris wheel and see an amazing view of the festival, into other parts of Munich. Aside from beer, Oktoberfest is also a celebration of Bavarian food. You will see many heart-shaped cookies for sale with sayings on them, along with traditional Pretzels. Other options include Hendl (chicken), Schweinsbraten (pork), Haxn (pork), Wurstel (sausage), Knodeln (bread or potato dumplings) and Weisswurst (white sausage).